Penrose Academy Esthetics and Laser graduate Rachel Long overcame many challenges to complete her training and excel as a medical esthetician, laser tech, makeup artist and front office coordinator. Rachel grew up spending tons of time in her mother’s salon and spa. Her grandma and great grandparents were nurses and doctors. Little did Rachel know, her early influences would shape her into becoming a medical esthetician. Then came the inspiration. Rachel worked for Massage Envy as the lead esthetician in Flagstaff as soon as she finished school, and for a skin and makeup boutique with Bare Essentials downtown. From there, she worked at numerous spas specializing in skin, makeup, and eyelash extensions. For the past 2 years she was an account manager at PCA SKIN. Rachel managed and educated over 400 professional accounts (solo estheticians, salons, spas, medical practices, etc) across the US and Puerto Rico. 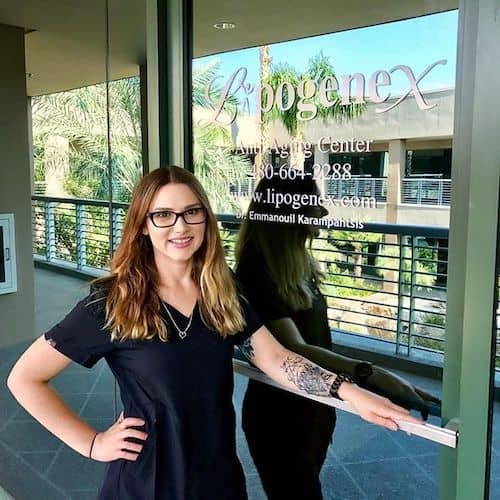 Rachel currently works for Dr. Karampahtsis at Lipogenex Anti-Aging Center as the medical esthetician, laser tech, makeup artist and front office coordinator. Congratulations on your success Rachel, you are a role model and an inspiration for Penrose students and staff. If You’re Interested in Learning About Skincare then Check out Penrose’s Esthetics Program and Laser Program, or call 480-222-9540 for More Info.